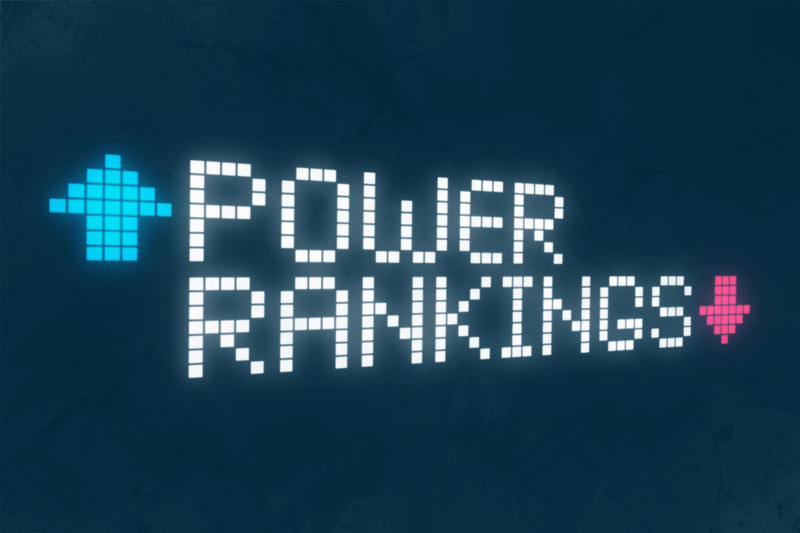 Power Rankings: Week 10 - The Point Data-driven hockey storytelling that gets right to the point. 8 game win streak and a big win against the Leafs, their biggest competition in the Atlantic, what more can they ask for. Tampa’s on fire right now and just added Andrei Vasilevskiy back to the mix. They’re leading the league by 8 points and are starting to look like an obvious President’s trophy favorite. 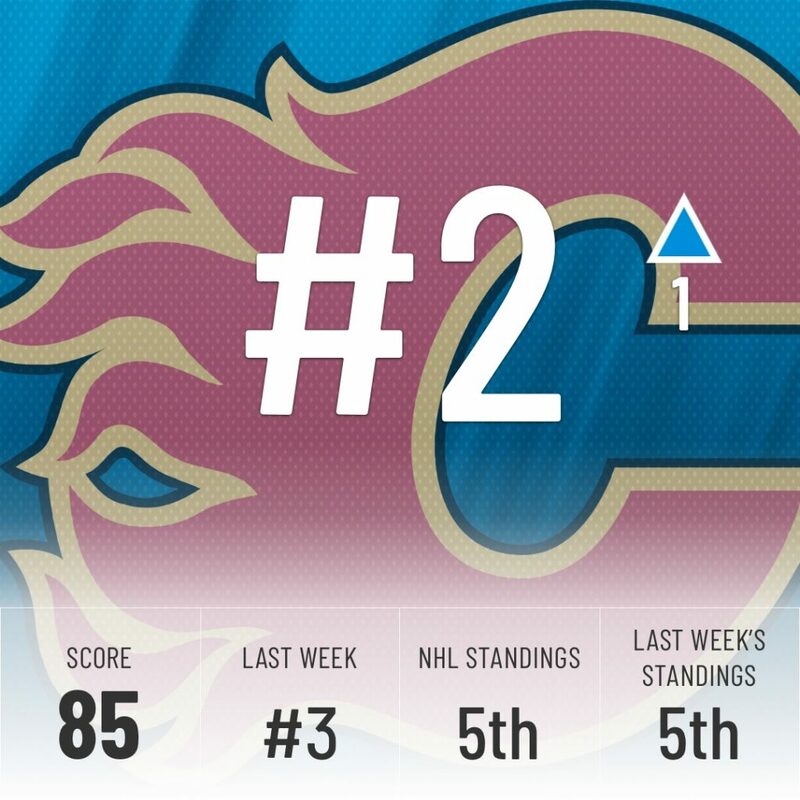 Calgary’s 7 wins in its last 8 makes them one of the hottest teams in the league. They knocked off the Predators this week, who are the top-ranked team in the west but the Flames are showing signs of knocking them off their throne. Mark Giordano came back from his suspension and continued his hot play. He now has 8 points in his last 3 games and has himself in the discussion for the Norris trophy. We talked last week about the weak competition the Jets had been squeaking by against and they followed that up by getting shut out by the Blues. What a wake-up call! The Jets went on to win 3 straight with a +10 goal differential and knocked off the red-hot Oilers in overtime. The Super Computer was suitably impressed. The Jets have a big test against the Lightning this week which will be a good indicator of how good this team really is. 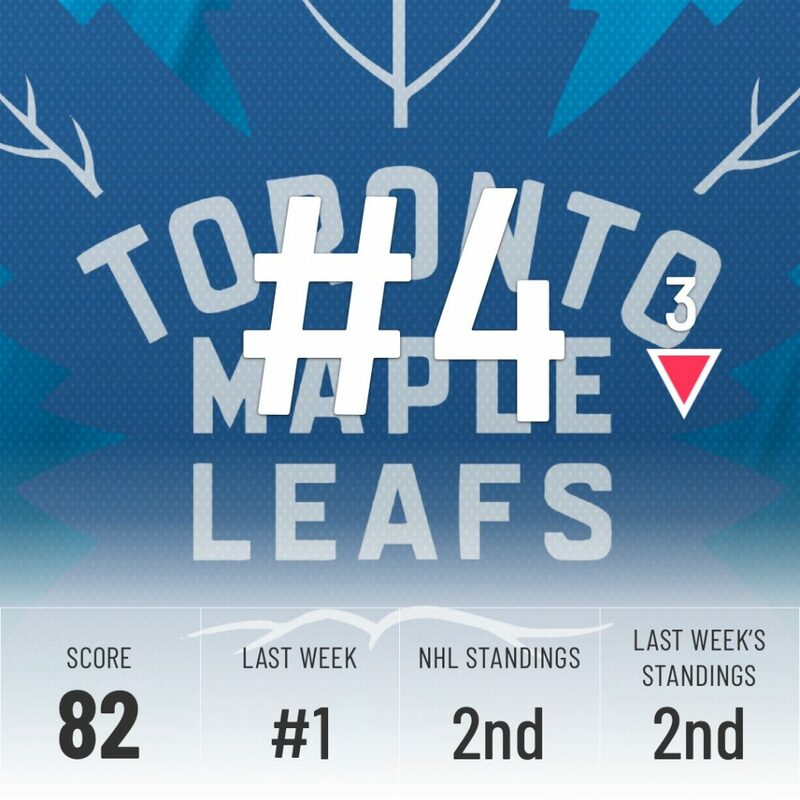 Tough week for the Leafs. 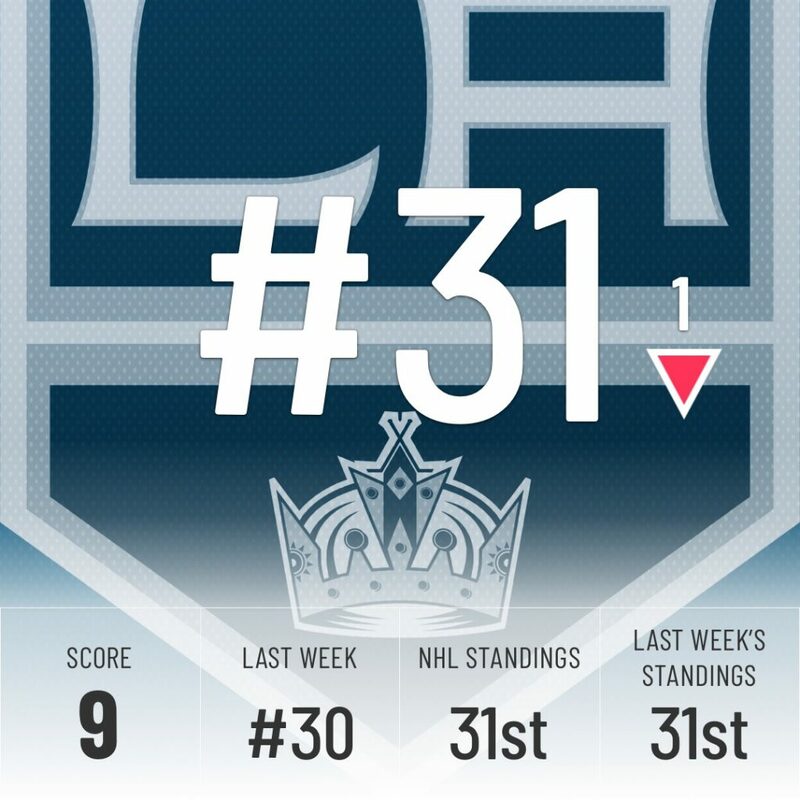 Losses to the Bruins and the Lighting have them dropping 3 spots in our rankings. They’re still one of the top teams in the East but this week showed they aren’t invincible and have a few things to work out before they plan their Stanley Cup parade. 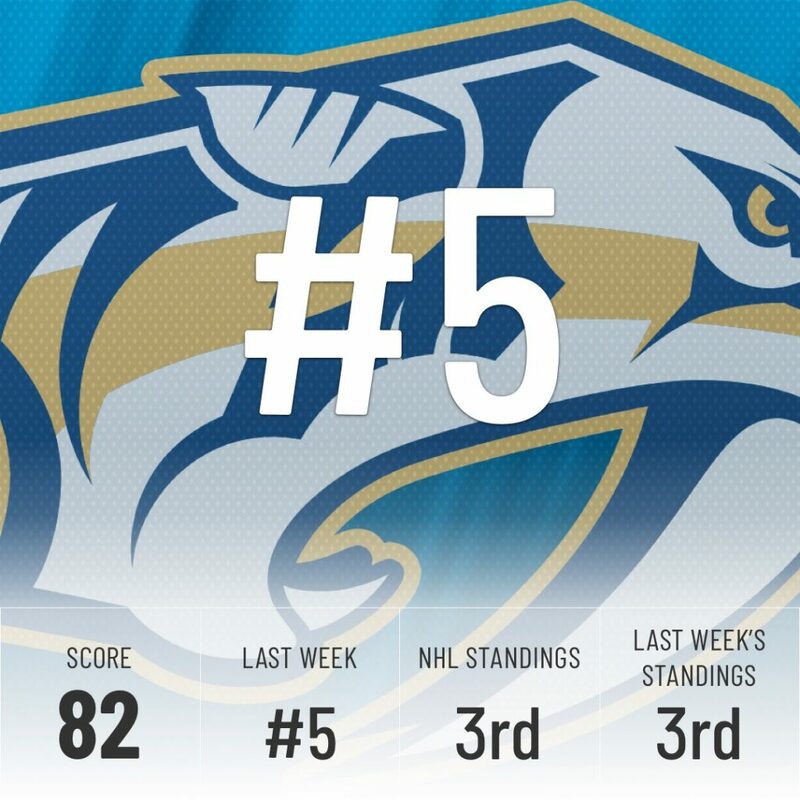 A loss to the Flames and two wins over teams in the bottom half of the league leaves the Preds in limbo. They didn’t impress the Super Computer last week and this week its mind is unchanged. The Preds have a weak schedule ahead of them and need to start getting some decisive wins against these lower-end teams. 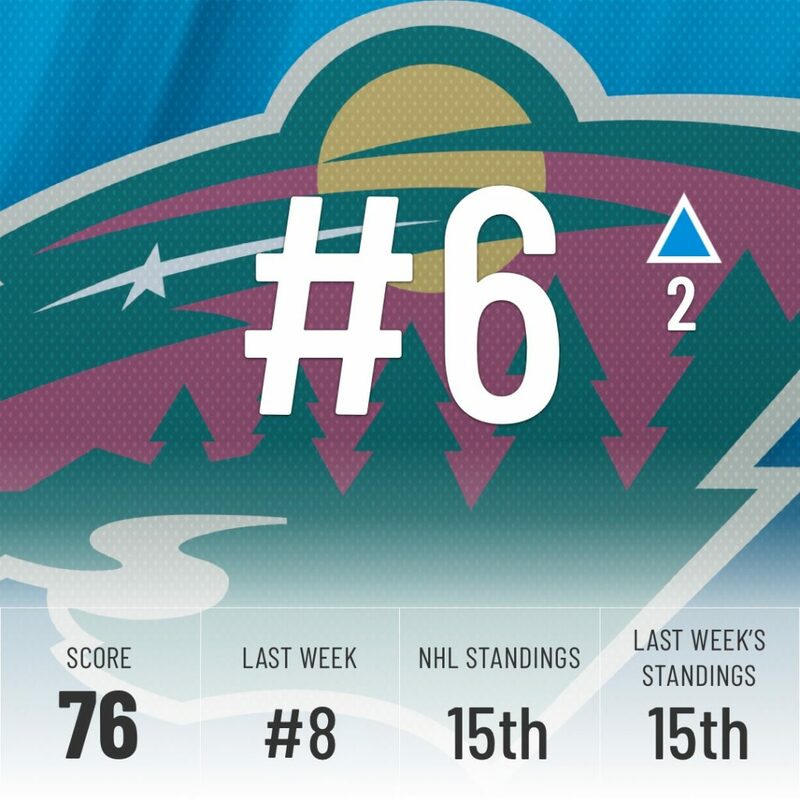 What a rollercoaster week for the Wild. They learned how to score from their beatdown against the Oilers and have a +12 goal differential in their last two games. The Super Computer is impressed! The Wild have been the best team at limiting high-danger scoring chances this year so if they’re starting to fill the net they’re going to be a dangerous team going forward. The Sharks started their week with a loss to Dallas but were able to exact revenge three games later. Wins against the Devils and the Coyotes aren’t all that impressive but three wins and one loss moves them up two spots in our rankings. Only two games this week for the Avalanche and both of them losses. 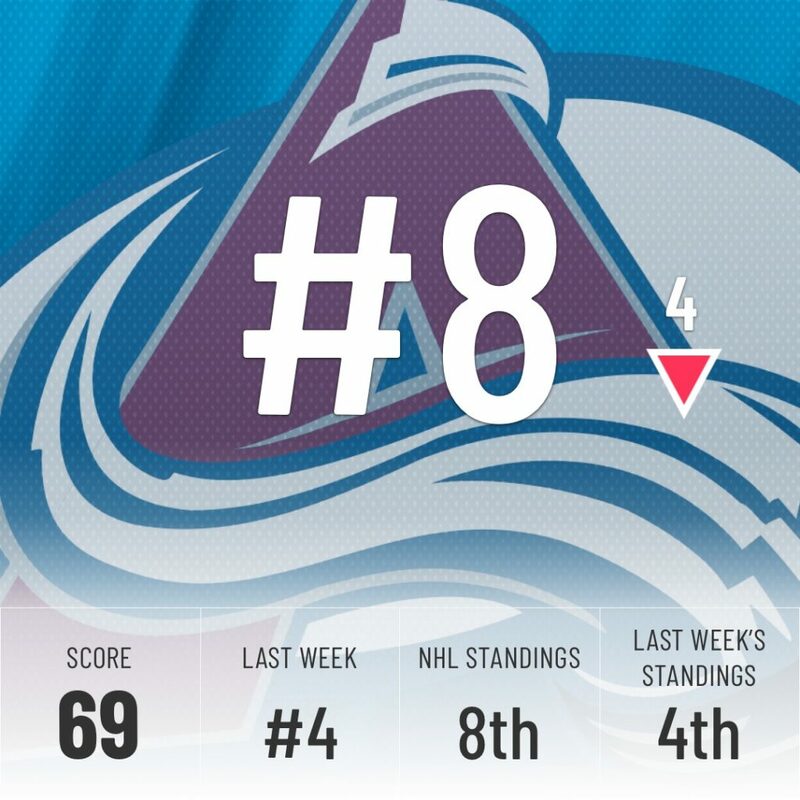 The Avs had a chance to show themselves as contenders taking on the Lightning and the Oilers and they failed. The Super Computer was disappointed with their effort and dropped them 4 spots because of it. Giving up 13 goals in 2 games will never make the Super Computer very happy. 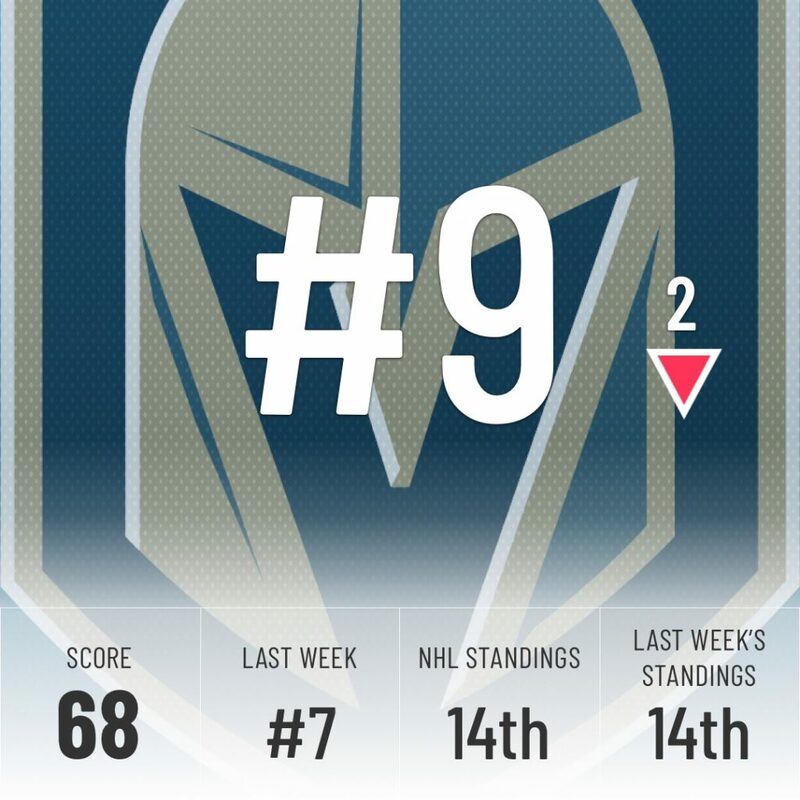 Vegas did win two of three games, but being manhandled 5-1 by the Kings did not sit well with the Super Computer, who dropped the Knights two spots as a result. They have a week of softer matchups coming up against teams from the Metropolitan, none of which rank higher than 15th in our rankings. They have a very good chance to add to their nine wins in their last 11 games. 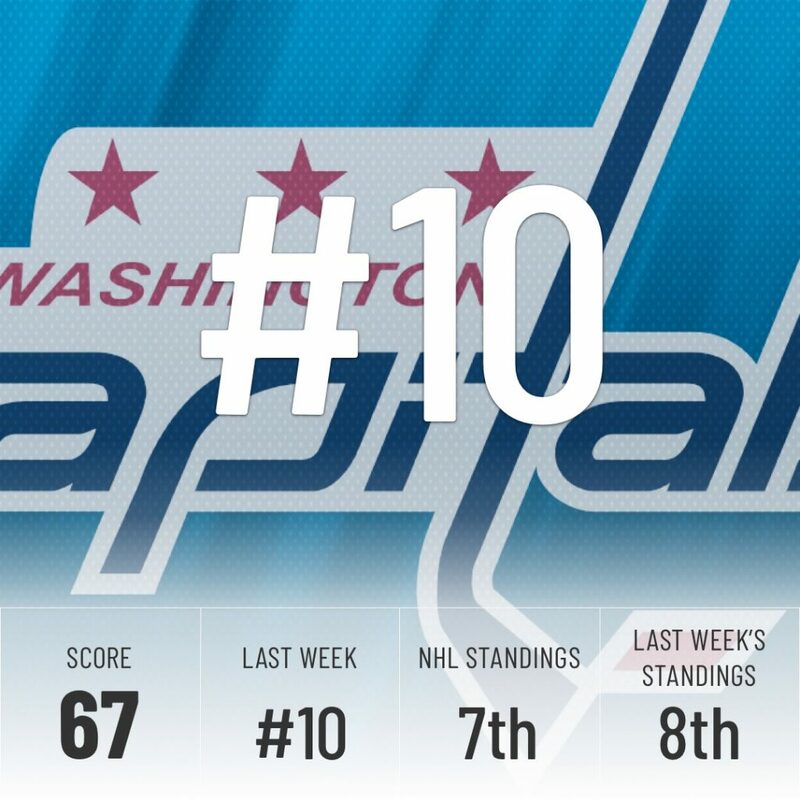 We said last week the Capitals needed to win out their two-game week against weaker opponents to hold on to the top 10 and that’s exactly what they did, winning both games in dominant fashion. Alex Ovechkin added his 21st career hat trick for good measure, moving to 12th on the all-time list of career hat tricks. 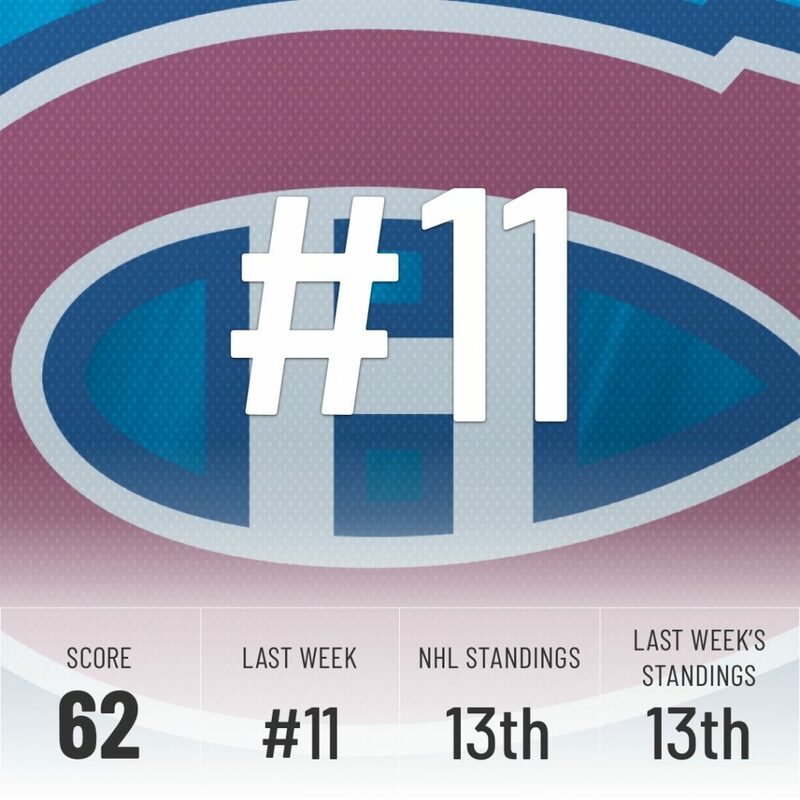 It was a solid week overall for the Habs, but sandwiched between a pair of wins was arguably their worst game of the season, a 7-1 defeat in Minnesota. Montreal has now been flirting with the top ten for a second straight week and their defense corps is finally fully healthy, as Noah Juulsen returned against the Wild. 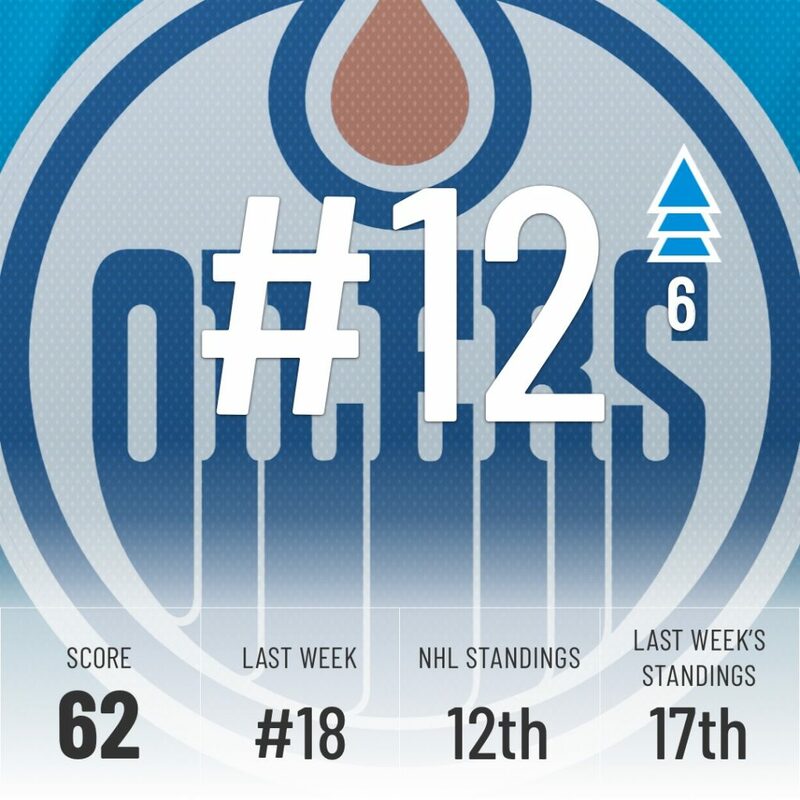 The Oilers had a difficult schedule on paper, facing four teams in the top 10 of our rankings, but they played great and went 3-0-1, including a 7-2 beating of the Wild. Ken Hitchcock has done wonders for this team since being hired and Edmonton is the biggest riser this week. 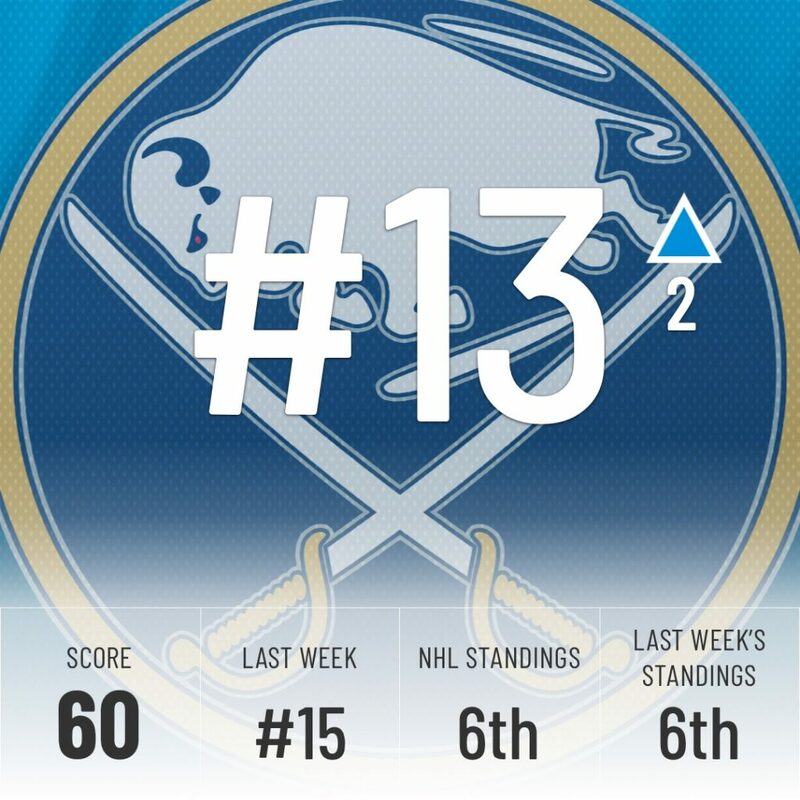 Buffalo finally snapped its five-game losing streak this week, beating the Kings and Coyotes. Rasmus Dahlin keeps looking better and better, showing off the skills that made him the consensus 1st overall pick in the last draft on plays like this one. Boston started off its week with a statement 6-3 win over the Maple Leafs and finished the week a perfect 3-0-0. 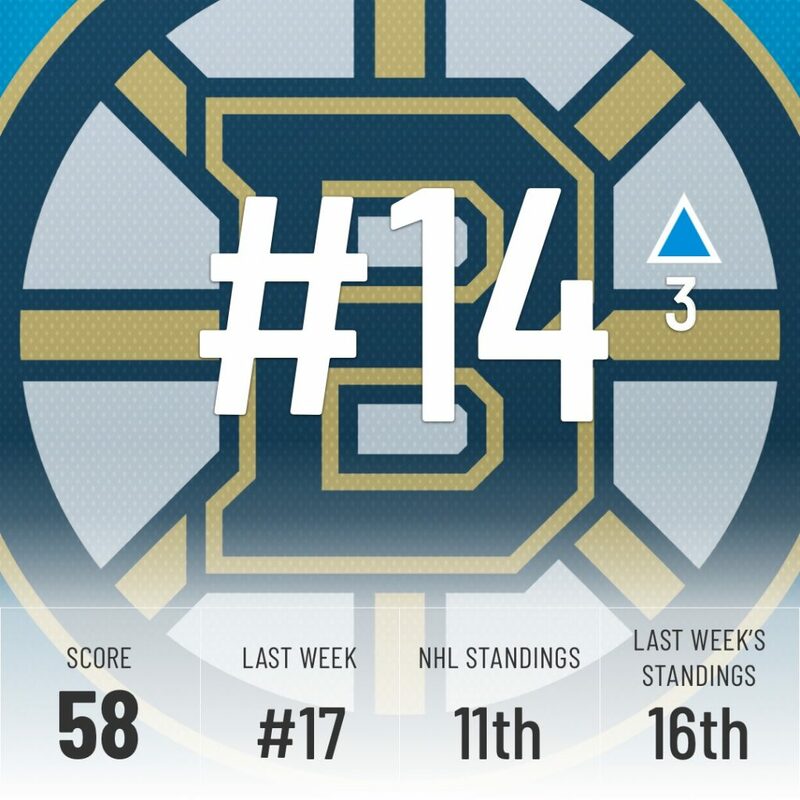 David Krejci has played great since being moved up to the top line with Brad Marchand and David Pastrnak and the Bruins will only get stronger as their long list of injured players slowly make it back to the lineup. 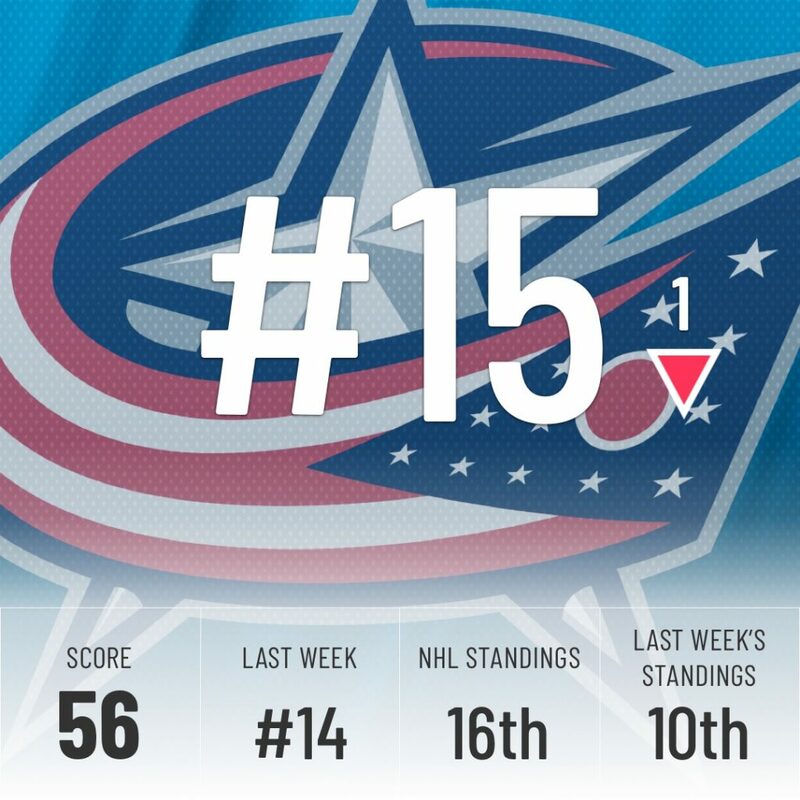 Just like Detroit, Columbus’ only win came against the last-place Kings, so the Super Computer decided to knock them down one spot. Their goal differential is an unimpressive +3 for the season and both the Super Computer and the standings agree, this is a team that belongs in the middle of the pack. The Penguins are coming off a rough week, losing to a pair of bottom feeders in Ottawa and Chicago and escaping the Islanders with a shootout win. Pittsburgh now has a busy week coming up, with five games in seven days. A strong performance could get them back in a playoff spot. A 1-2-0 week for the Hurricanes was overshadowed by some odd quotes from their owner Tom Dundon. “We won’t be drafting defense in the first round as long as I’m here,” said Dundon, “I’ve got to have more offense, I want to lose five to four, not two to one. If we lose five to four, I’ll at least have fun.” Dundon almost got what he asked for, only for Jeff Petry’s empty-netter to ruin a perfectly good 5-4 score and hand the Hurricanes a 6-4 loss instead. 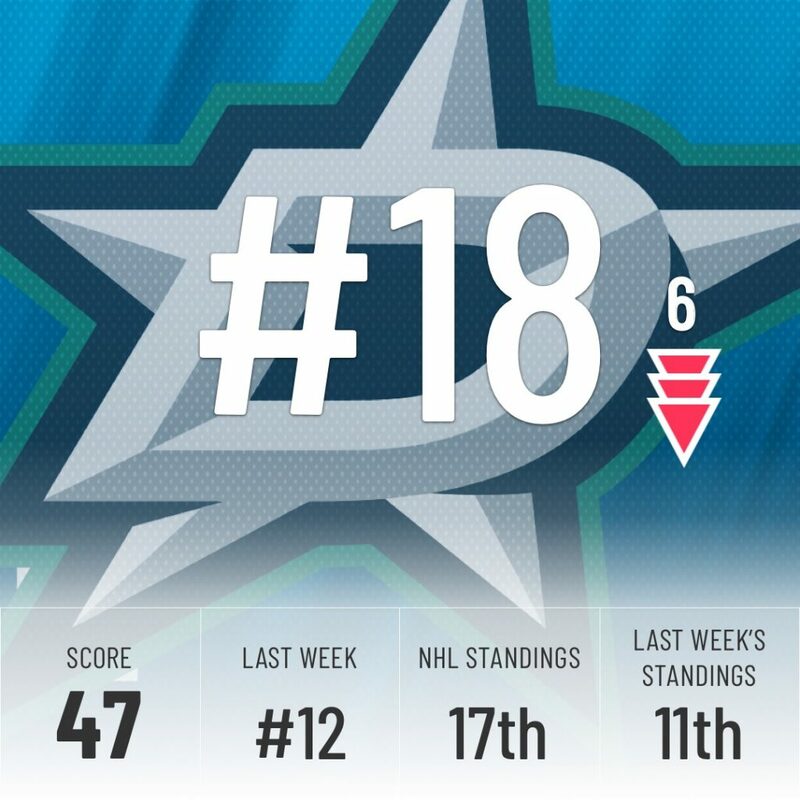 Massive drop this week for the Stars, who fall down six spots in both the standings and our rankings. The schedule isn’t on the Stars side either. 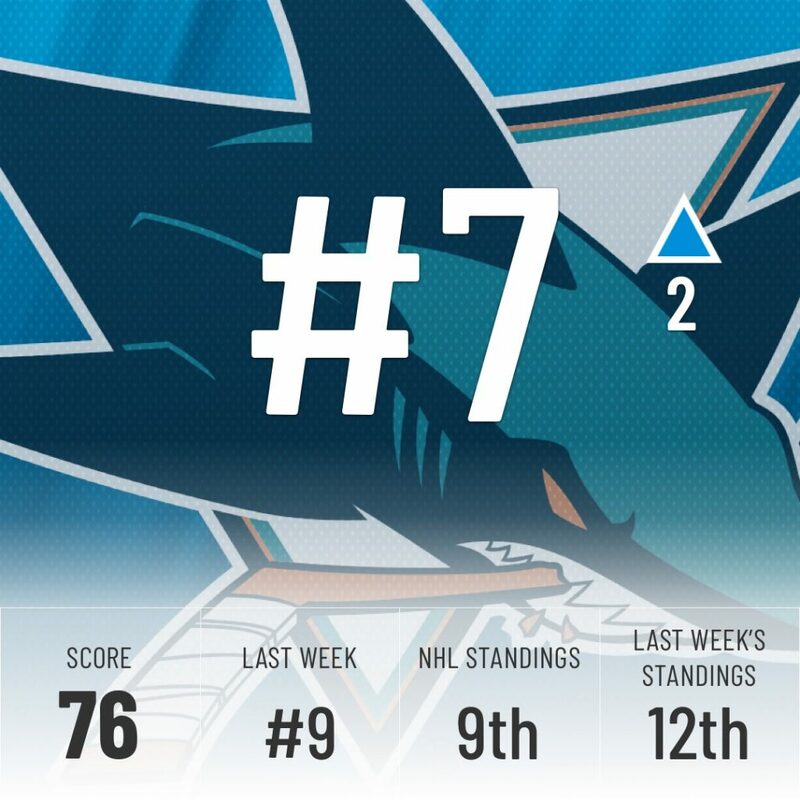 Last week they faced the Sharks twice and the surging Golden Knights. Next week doesn’t get any easier, with a four-point game against division rival Colorado and a game against the Flames, who are now second in our rankings. A strong showing could shoot them back up the standings, but it’s far from a guarantee. 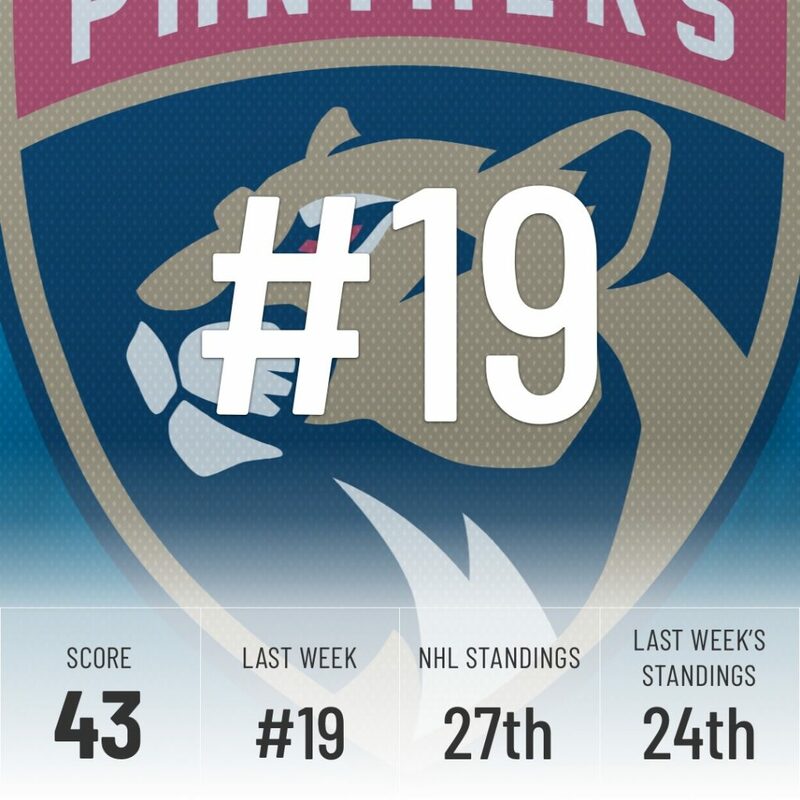 We said last week the Panthers needed to string wins together to stay in the playoff hunt, but instead, they went ahead and lost three straight, including two losses to teams below them in our rankings. 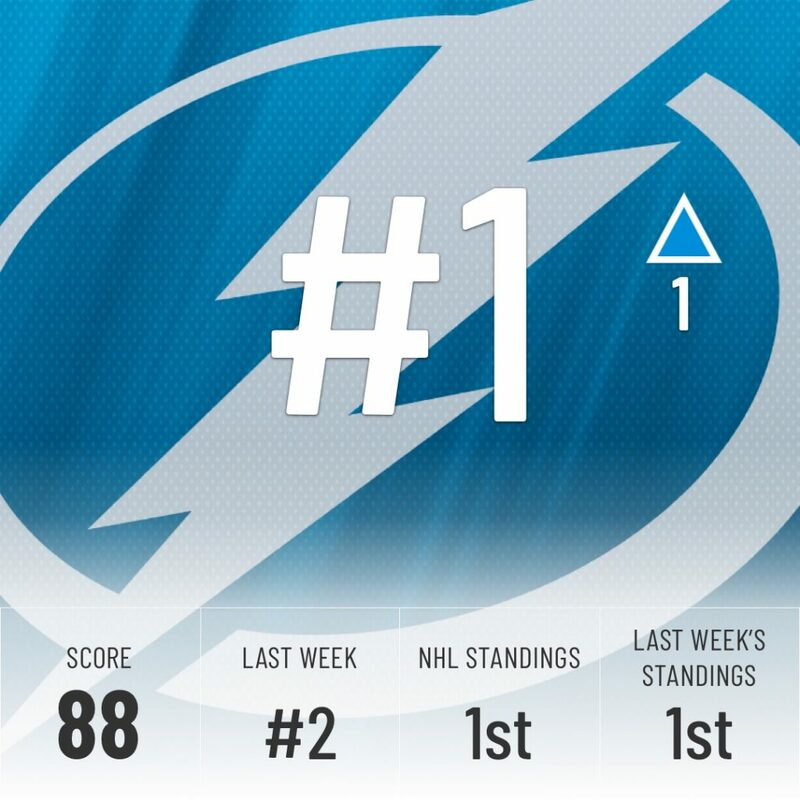 The Super Computer still likes this team a lot more than their place in the standings indicates, but a tough week that includes two games against the Leafs will be a big test for this Florida squad. They hold on to a playoff spot in the Metropolitan division for now, but the surging Penguins are knocking at the door. They’ll have to do a lot better than a 1-2-0 week if they hope to hold on to a top-3 spot in the division. 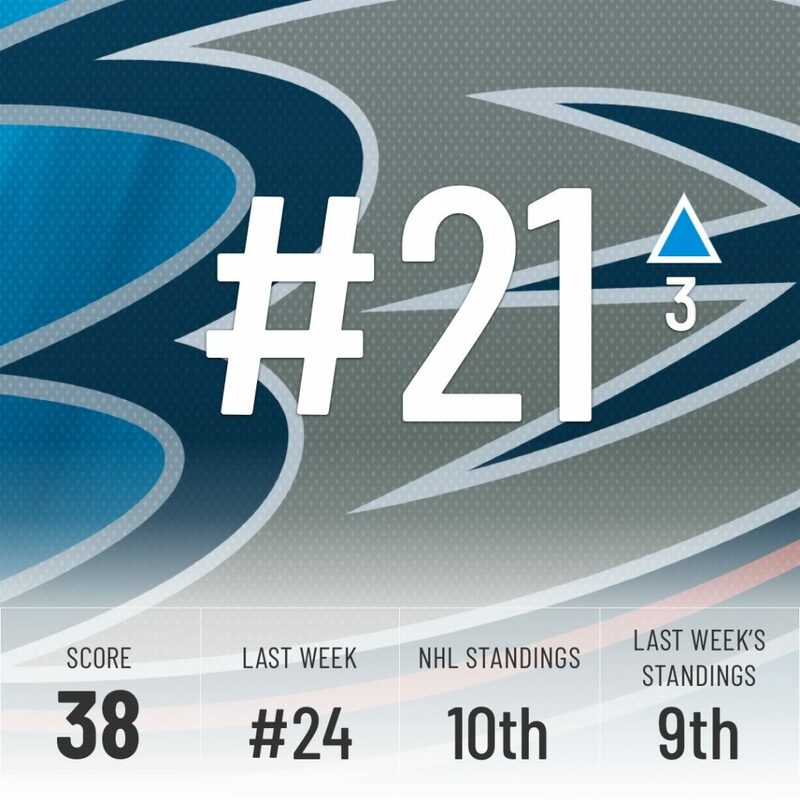 The Ducks have been steadily moving up the rankings, as they were next to last three weeks ago. This week, they finally make it out of the bottom 10 and have now won nine of their last 11 games. They still own a -10 goal differential, the last remaining indicator of their horrendous defensive performance to start the season. 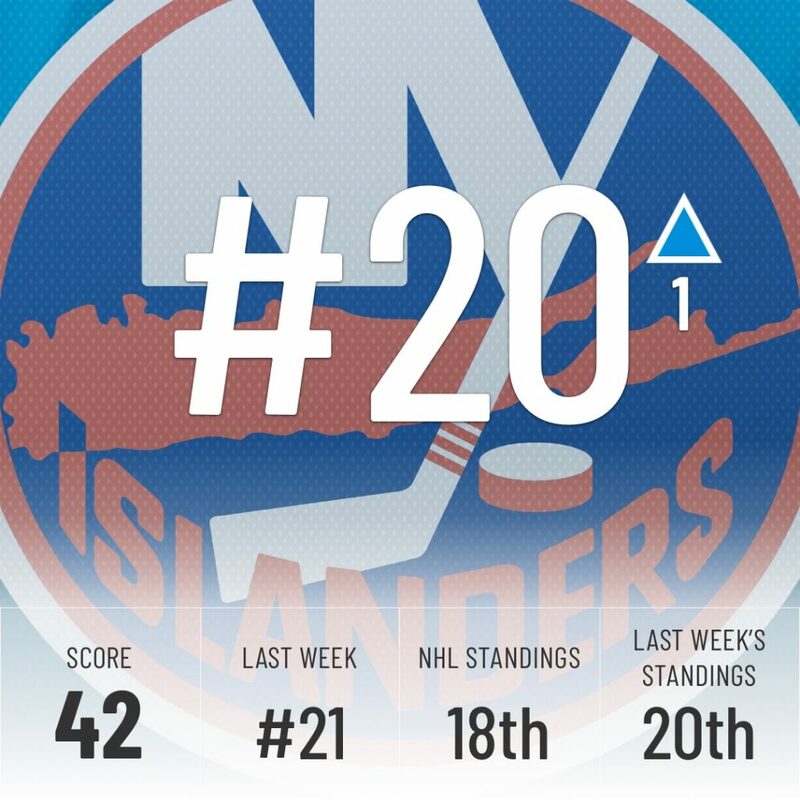 The Super Computer prefers to remain patient with them and only moves them up to 21st despite their 10th place in the standings. 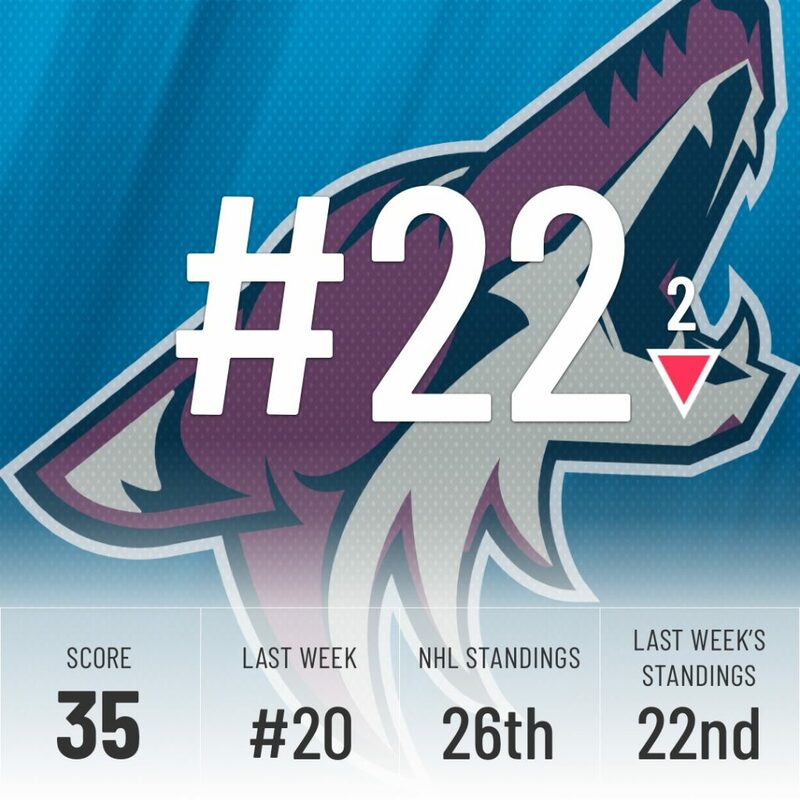 The Coyotes followed up a 7-spot climb in the rankings with a 0-3-0 week, but the Super Computer still likes this team and believes they will move up the standings going forward. Starting goalie Antti Raanta might be out for the season, but Darcy Kuemper is back, rookie Adin Hill has been spectacular so far, and new acquisition Nick Schmaltz has seven points in eight games since joining the team. How weak is the Metro division? 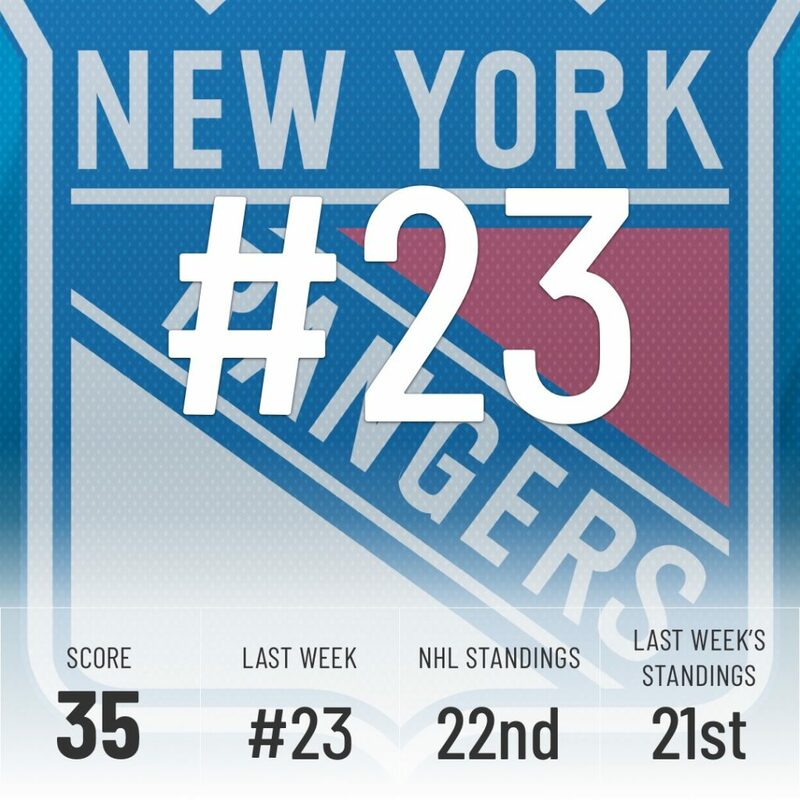 Well, the Rangers are 22nd in the standings and 23rd in our rankings, yet are just one point away from a top-3 spot in the division. They had a second straight two-game week and split it down the middle, doing nothing to gain or lose the trust of the Super Computer. 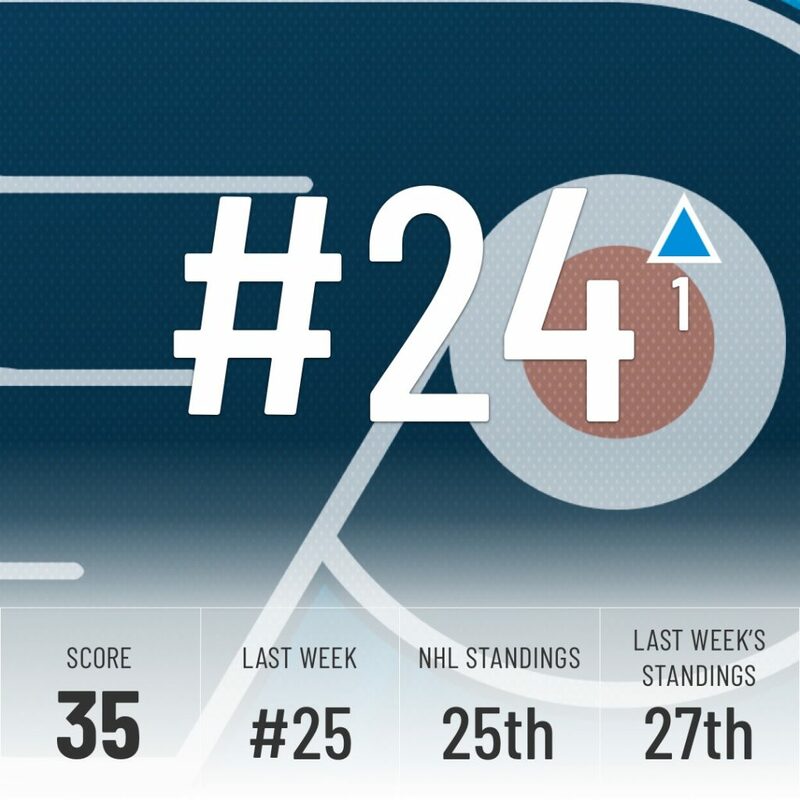 The Flyers are coming off a very high-scoring week, scoring an average of four goals per game. Unfortunately, they gave up five goals per game, including a 7-1 beating at the hands of the Jets. On the bright side, it looks like Gritty has some big plans going forward. 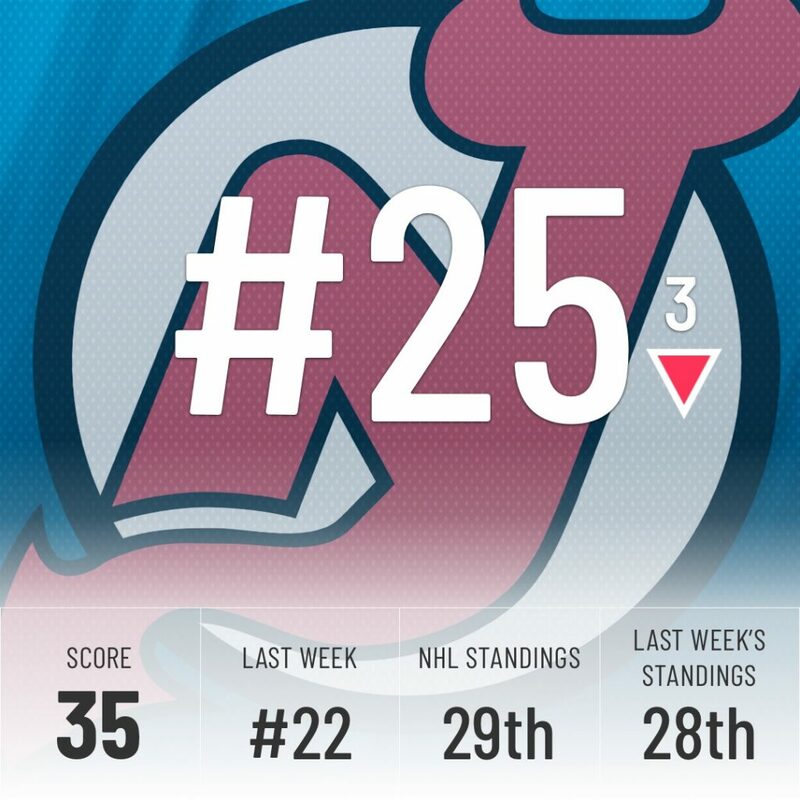 The Devils keep moving all over the place in our rankings. Two weeks ago they dropped nine spots, then moved up two last week only to lose both of their games this week and fall down another three spots. 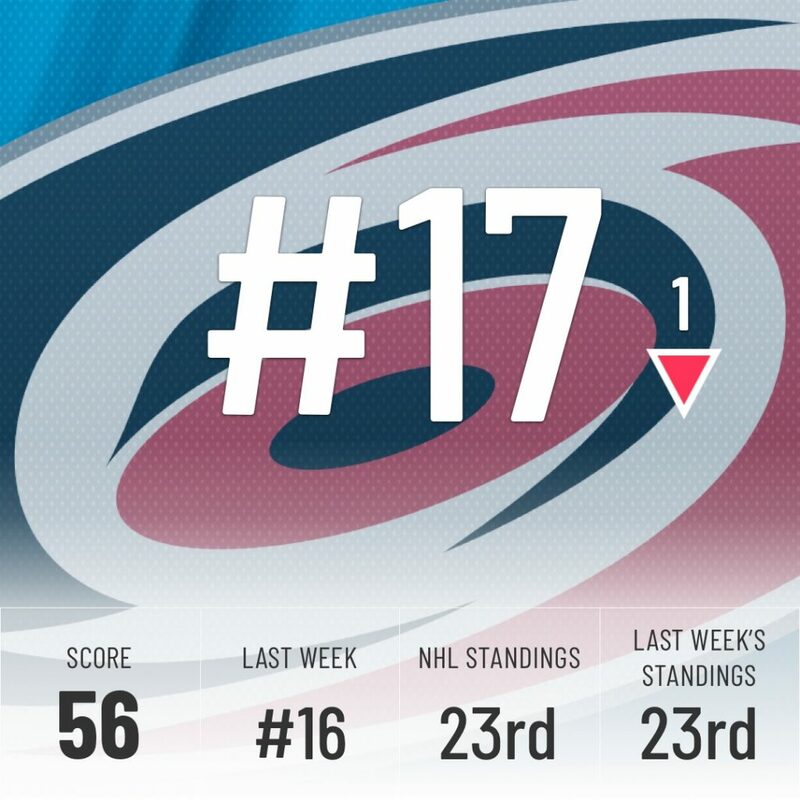 The Super Computer does like this team, though, and expects them to move up the standings going forward, but they have a tough week coming up, with games against Vegas, Toronto, and Nashville, all top ten teams in our rankings. 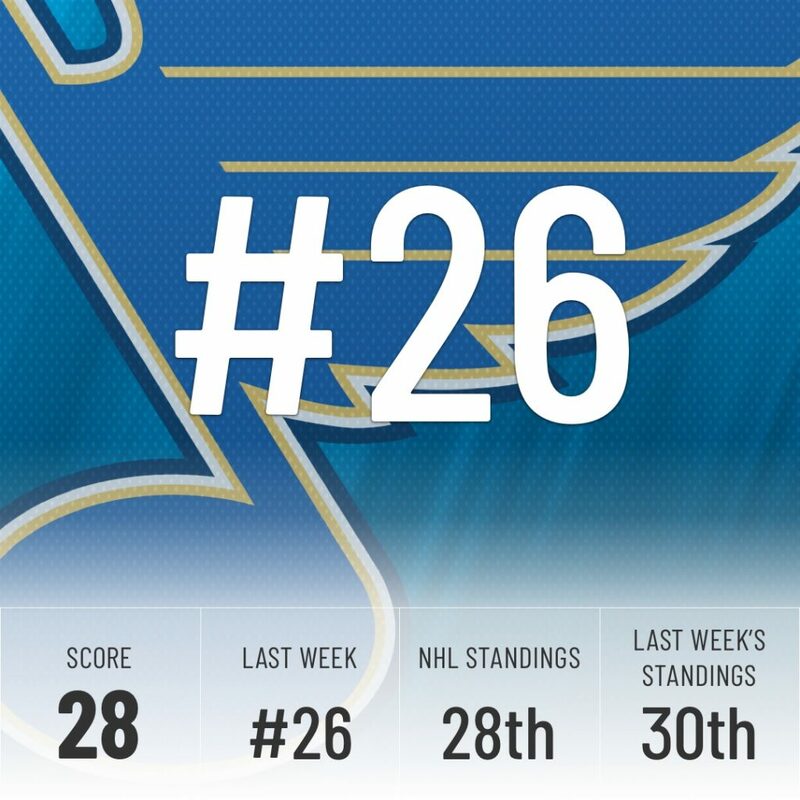 Another week of inconsistent results for St. Louis. 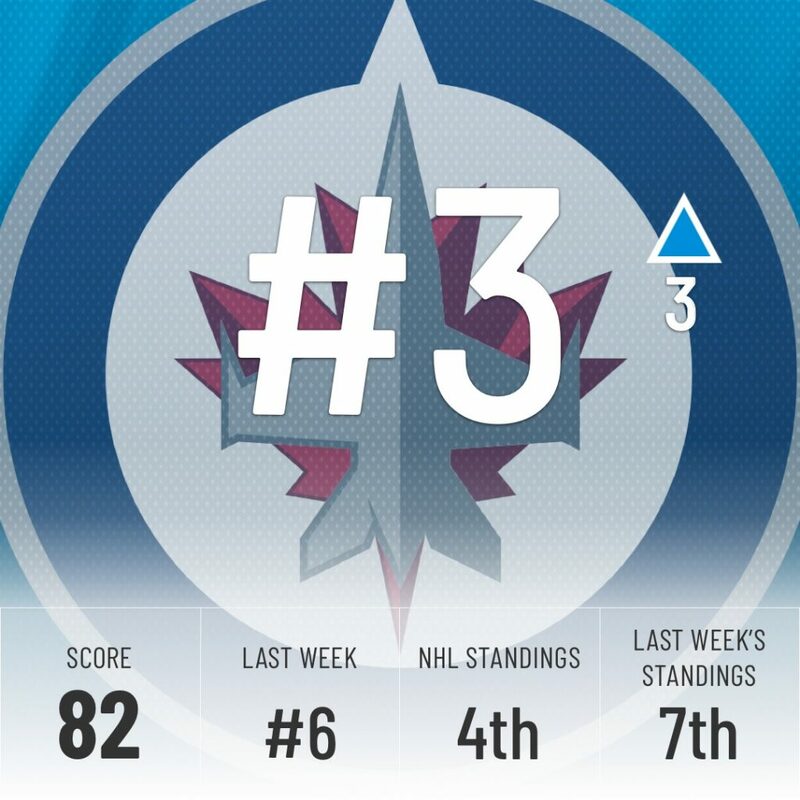 They won a close game against the Jets, a top-3 team in our rankings, only to get blown out by the Canucks on the next game. They finished the week with a positive record but a -3 goal differential. The Blues have yet to string together more than two wins in a row but they’ve also never lost more than three straight. They are arguably one of the most disappointing team this season after a busy offseason that led many, including us, to predict a top-3 finish in the Central for St. Louis. Detroit holds on to 27th, but as mentioned earlier, the gap between them and Vancouver has shrunk considerably. Not surprising when your only win of the week came against the lowly Kings. 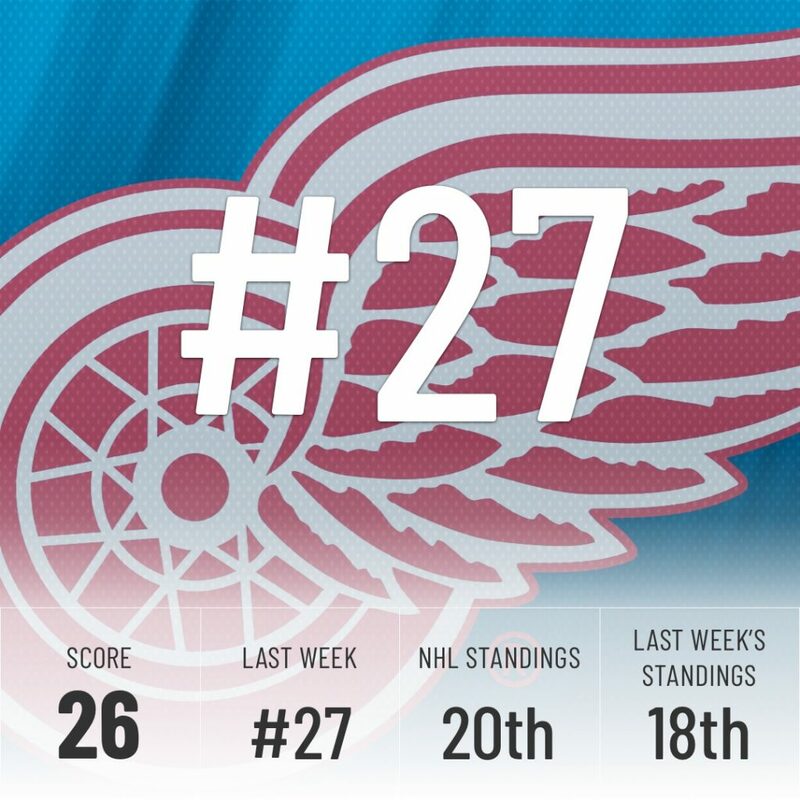 Even a strong 2-0-1 week wasn’t enough to convince the Super Computer, who keeps them in 28th place for the second straight week, although they did close the gap on 27th place. 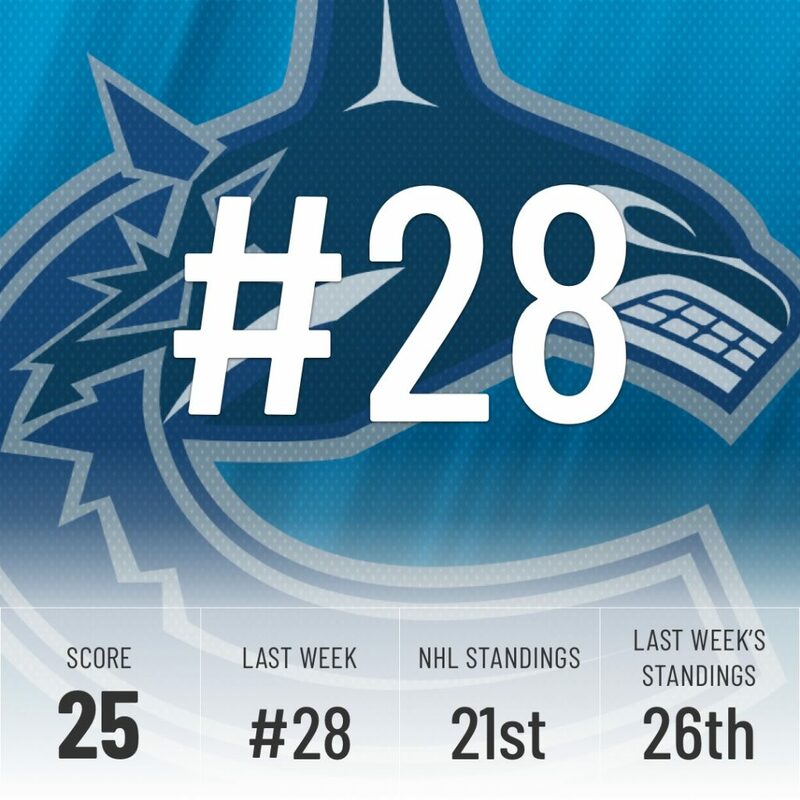 The Computer firmly believes this Canucks team belongs in the bottom five. They do have a five-game homestand coming up, which is the perfect opportunity to show they belong higher in the rankings. 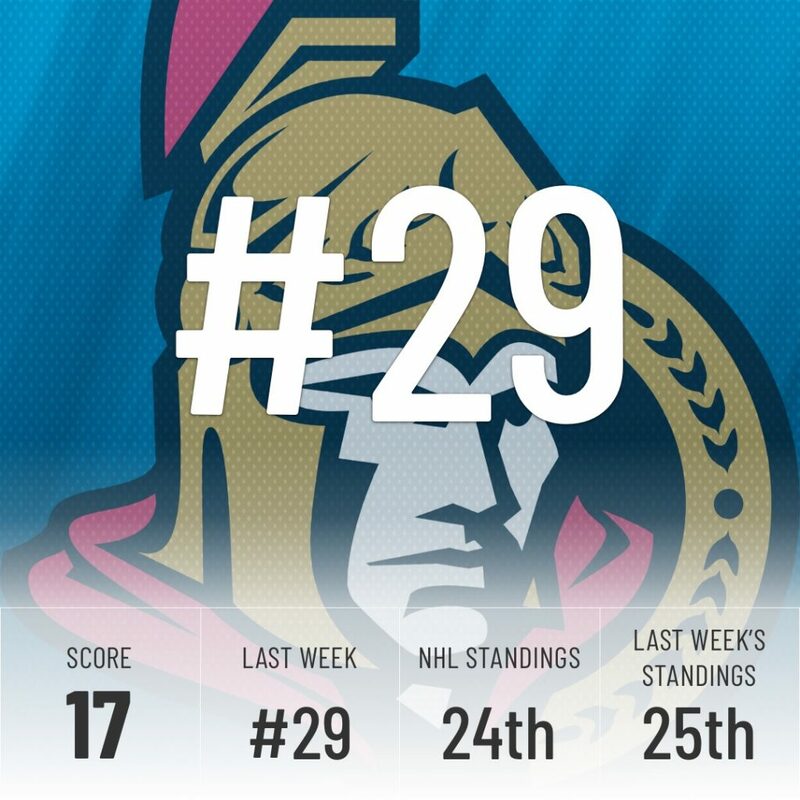 On the bright side, the Senators defense tightened up this week. They gave up one goal to Pittsburgh, two to Boston, and three to Nashville, all elite teams. But on the flip side, they lost two of three and the Super Computer believes they will fall further down the standings going forward. They still allow a league-worst 3.91 goals against per game. It will be hard to win until this number goes way down. 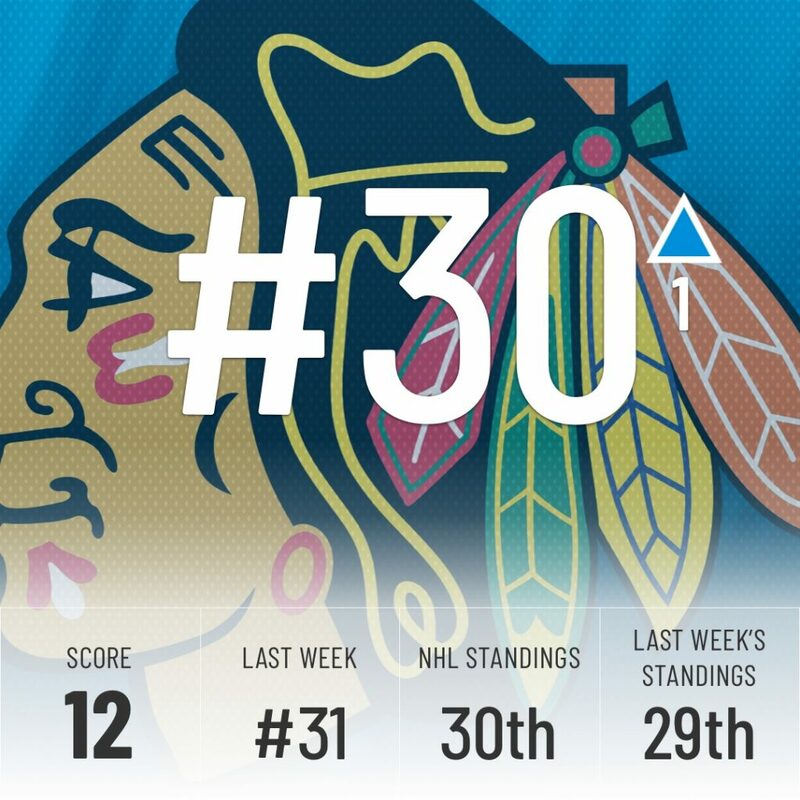 With a league-worst -31 goal differential and a league-low 10 wins, things are looking bleak in the Windy City. 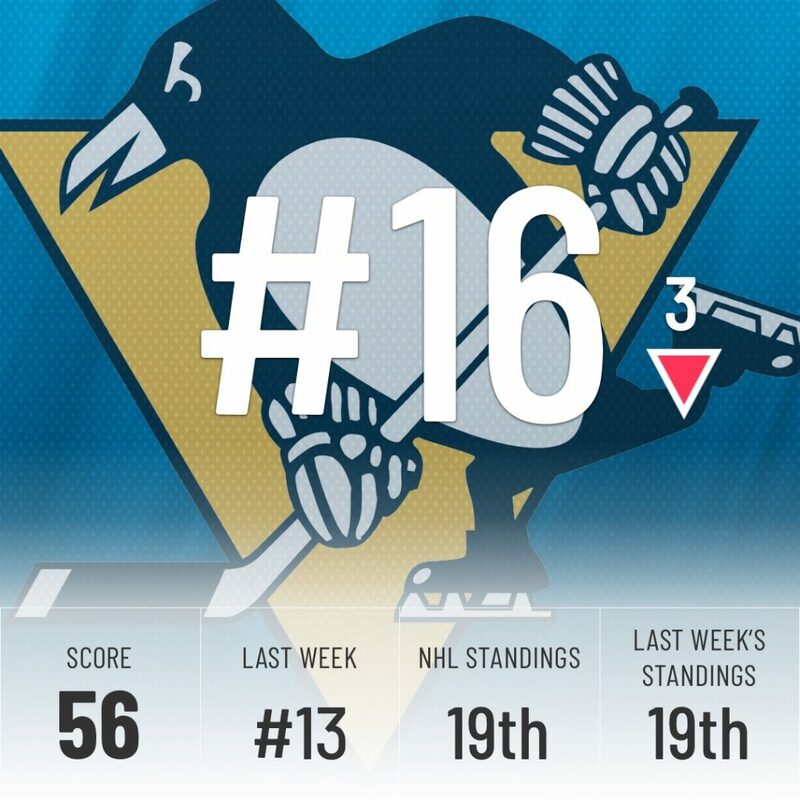 They did get a convincing 6-3 win against Pittsburgh, but they’ll have to do much more to impress the Super Computer and move out of the bottom two going forward. They had a promising start to the week, beating Vegas 5-1, but it was all downhill from there. Three straight losses get them right back in last place, a spot they’ve occupied in all but one week this season. Anyone excited to see Jack Hughes and Anze Kopitar next season?